Preheat oven to 450F/220C. Spray a large baking sheet with a little non-stick spray or mist with olive oil. Peel the squash, then cut into pieces that are about an inch square. Wash the thyme leaves if needed and pat dry with paper towel, then chop with chef’s knife. If you only have dried thyme, use half as much and crush it with a mortar and pestle or heavy knife. 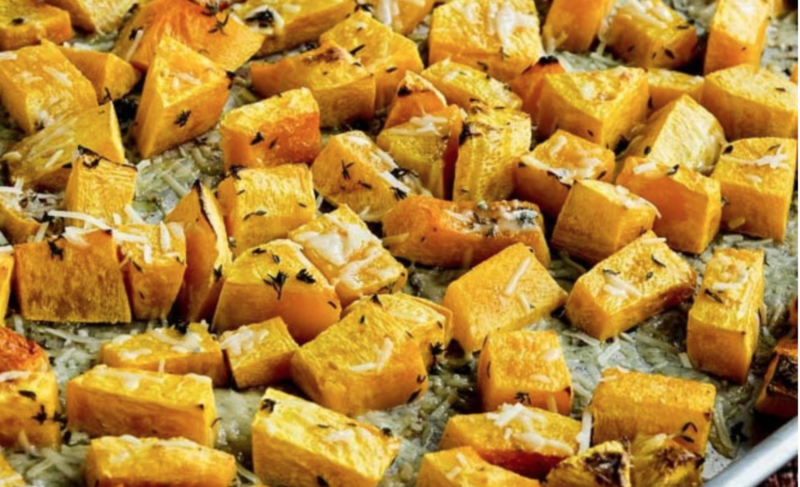 Mix together the olive oil, lemon juice, and thyme, then put squash cubes into a bowl and toss with that mixture. Spread out the squash cubes on the baking sheet so they’re in a single layer with flat sides down. Roast for 30 minutes, then turn and roast for about 15 minutes more (or until squash is getting soft and is nicely browned. Sprinkle with coarsely-grated Parmesan and put back in the oven for about 5 minutes more. Serve hot, with salt and freshly-ground black pepper to add at the table as desired.